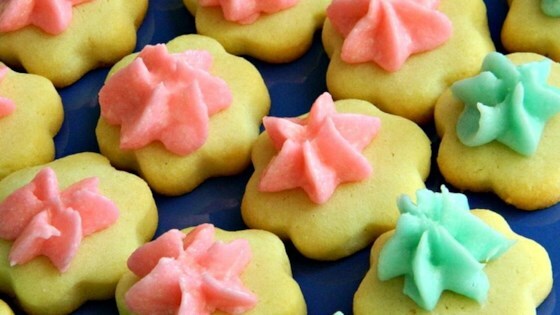 "These are excellent butter cookies that will hold your holiday stamp well and not change size when baking. Its our family secret to you!" Gradually stir in the flour. Cover and chill dough until firm. Roll dough out on a floured surface to 1/4 or 1/8 inch thick and cut with cookie cutters or stamps. Bake at 350 degrees F (175 degrees C) for 8 to 12 minutes. I added some flaked coconut and vanilla essence, and a teeny bit more flour. The cookies came out excellent, and I ate 3 straight away. Delicious! Great cut-out cookies that are fun for the kids to help make!